When Do We Perform Lateral UKA? On the other hand, any type of inflammatory arthritis, such as rheumatoid arthritis, is recognized as a contraindication for UKA because this can be a cause of rapid degeneration of the unreplaced compartments. 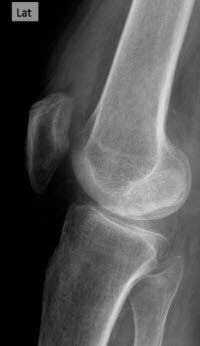 Mild chondrocalcinosis, which is mostly a radiographic finding, may be accepted as an indication to perform UKA, in contrast to the productive chondrocalcinosis often associated with cyclic effusion of the knee. How Do We Perform Lateral UKA? We perform lateral UKA under general or epidural anesthesia on a routine operating table using two leg holders: one at the lateral aspect of the thigh and the second one below the foot. The knee is flexed at 90° for the skin incision. The upper limit of the incision is the superior pole of the patella extending distally toward the lateral side of the tibial tuberosity but ending 2 cm under the joint line previously located (Figure 1). Figure 1. 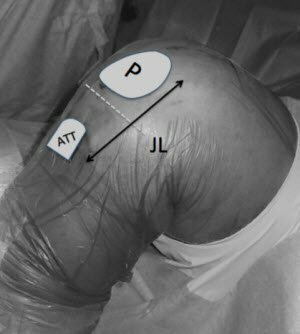 The upper limit of the incision is the superior pole of the patella (P) extending distally toward the lateral side of the anterior tibial tuberosity (ATT) but ending 2 cm under the joint line previously located. The proximal part of the incision is more essential for the procedure and two-thirds of the incision should be located above the joint line (JL). A lateral arthrotomy is performed and the synovial cavity is opened. The lateral part of the fat pad in the way of the condyle is then excised to properly visualize the condyle, the anterior cruciate ligament (ACL), and the corresponding tibial side of the tibial plateau. It is important to note that the principles of ligament balancing cannot be applied to UKA and the collateral ligaments should not be released in UKA. Before making the vertical cut, searching for and marking the anterior contact point between the tibial native tibial plateau and the anterior part of the femoral condyle can be helpful to optimize the positioning of the implant. In lateral UKA, the tibial resection should be minimal; the disease is more often on the femoral side. The tibial cut is made using an extramedullary rod. The proximal part of the guide rests on the anterior tibia pointing toward the axis of the tibial spines, and the cutting part of the guide rests only on the upper lateral tibia to be resected. The anteroposterior position of the guide is adjusted distally to reproduce the natural upper tibial slope of the lateral compartment, usually around 0°. To complete the tibial cut, the sagittal tibial cut should be done. The medial border of the plateau should be determined in flexion and extension and marked with the Bovie while respecting the tibial spine eminence. Once the line has been made with the Bovie, the cut can be done freehand and, of course, particular care should be taken to protect the ACL. For the intramedullary technique, the entrance hole of the distal femur is centered above the roof of the intercondylar notch (Figure 2). The drilling of the femoral medullary canal requires bringing the knee to 60° of flexion. Figure 2. View of the lateral femoral condyle, the entrance hole for the intramedullary guide is centered above the roof of the intercondylar notch. The distal femoral cut can be made by confirming the angle between the anatomic and mechanical axis previously calculated on the full weight-bearing view (usually 3° to 5°). We then check the extension space using a dedicated spacer block (Figure 3). Figure 3. The extension space is tested using a dedicated spacer block. The next challenge concerns the remainder of the femoral cuts (posterior cut and chamfers), which will be completed using the appropriate cutting block. The rotation setup of the cutting block is the crucial point of the procedure. The lateral aspect of the femoral cutting block should follow the lateral aspect of the condyle to avoid any excessive internal rotation in extension due to the screw-home mechanism related to the natural divergence of the lateral femoral condyle. The size of the cutting block is determined once this femoral finishing guide is positioned on the distal femoral cut, searching for the best compromise between an anatomically centered position on the femoral condyle and a long axis perpendicular to the resected tibial plateau. The top of the finishing guide should be localized 1 to 2 mm above the deepest layer of the cartilage to avoid a potential notch between the femoral implant and the patella. The control of the mediolateral position of the femoral cutting guide, which determines the position of the final implant, as previously mentioned, is crucial. The posterior cut and the chamfrains are made and the cutting guide is removed. Removal of any posterior osteophytes is then necessary, using a curved osteotome to increase the range of flexion and avoid any posterior impingement with the polyethylene in high flexion. The size of the tibial tray should now be determined, resulting in the best compromise between maximal tibial coverage and overhang, which might induce pain. The size of the anteroposterior portion of the tibial plateau sometimes differs from the size of the mediolateral portion, especially for female knees. Thus, different sizing trials are necessary to find the best compromise. It is important to keep the depth of the tibial cut as conservative as possible to take advantage of the strength of the tibial cortex and the increased area of contact proximally. The knee is then brought into maximal flexion and internally rotated. The final preparation of the tibia is completed with the appropriate guide with the underlying keel impacted in the subchondral bone. The flexion-extension gaps should be tested with the trial components in place and a trial polyethylene liner inserted. At that step, it is important to look for any impingement of the femur against the spine eminence in extension due to a lack of external rotation in flexion. 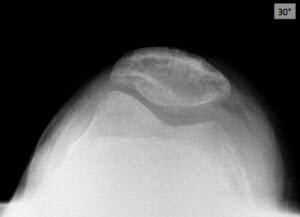 Once this has been verified, it is important to verify that there is a 2-mm protective laxity close to full extension to avoid any overcorrection of the deformity, which could lead to progression of osteoarthritis in the medial compartment. Under-correction of the deformity remains the basis for successful long-term results in lateral UKA. However, the polyethylene insert is often thicker for the lateral side than for the medial side in cases of femoral dysplasia. All components should be cemented for better fixation; long-term results suggest that loosening is not a common mode of failure with modern cemented, metal-backed components. The tibial component is cemented first, with the knee in full flexion and internally rotated to improve the exposure of the lateral compartment. Once the femoral implant has been cemented, bring the knee close to extension to help remove any posterior cement. Finally, the polyethylene can be inserted in flexion after cleaning and drying of the tibial implant (Figure 4). Figure 4. Final aspect of the knee after lateral compartment arthroplasty. Figure 5-6. Twenty two-year follow-up radiographs showing a good functional result, with no sign of wear or loosening. Figures 7-11 show the preoperative radiologic analysis of a 55-year-old man with a painful osteonecrosis of the lateral compartment of the right knee. A fixed-bearing UKA was performed in March 2013. Figures 12-13. Postoperative radiographs. Figure 12 shows the perioperative aspect of the condyle. Matthieu Ollivier, MD, PhD; Sébastien Parratte, MD,PhD; and Jean-Noël Argenson MD, PhD, are from the Institute for Locomotion, Sainte-Marguerite hospital, Aix-Marseille University, Marseille, France. 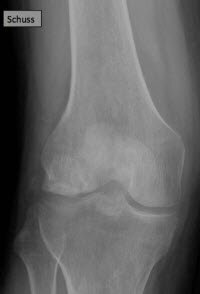 Ahlback S. Osteoarthrosis of the knee. A radiographic investigation. Acta Radiol Diagn (Stockh). 1968;Suppl 277:7-72. Argenson JN, Parratte S, Bertani A, Flecher X, Aubaniac JM. Long-term results with a lateral unicondylar replacement. Clin Orthop Relat Res. 2008;466(11):2686-2693. Argenson JN, Parratte S, Bertani S, et al. 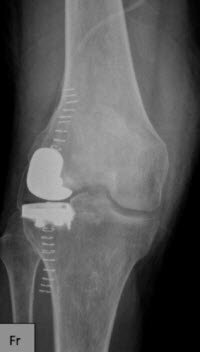 The new arthritic patient and arthroplasty treatment options. J Bone Joint Surg Am. 2009;91 Suppl 5:43-48. Argenson JN, Chevrol-Benkeddache Y, Aubaniac JM. 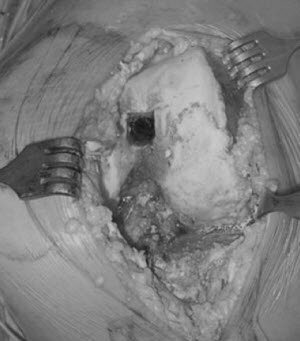 Modern unicompartmental knee arthroplasty with cement: a three- to ten-year follow-up study. J Bone Joint Surg Am. 2002;84(12):2235-2239. Berger RA, Meneghini RM, Jacobs JJ, et al. Results of unicompartmental knee arthroplasty at a minimum of ten years of follow-up. J Bone Joint Surg Am. 2005;87(5):999-1006. Pagnano MW, Clarke HD, Jacofsky DJ, Amendola A, Repicci JA. Surgical treatment of the middle-aged patient with arthritic knees. Instr Course Lect. 2005;54:251-259. Scott RD. Lateral unicompartmental replacement: a road less traveled. Orthopedics. 2005;28:983-984. Lustig S, Parratte S, Magnussen RA, Argenson JN, Neyret P. Lateral unicompartmental knee arthroplasty relieves pain and improves function in posttraumatic osteoarthritis. Clin Orthop Relat Res. Epub 2011 Jul 12. 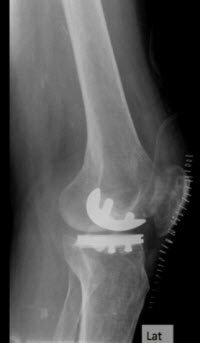 Dudley TE, Gioe TJ, Sinner P, Mehle S Registry outcomes of unicompartmental knee arthroplasty revisions. Clin Orthop Relat Res. 2008;466(7):1666-1670. 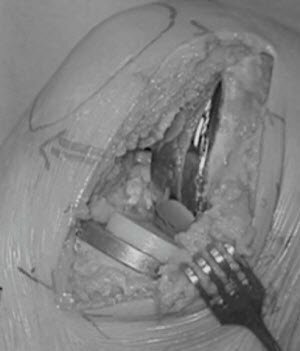 Argenson JN, Parratte S. The unicompartmental knee: design and technical considerations in minimizing wear. Clin Orthop Relat Res. 2006;452:137-142. Cartier P. Is the unicondylar prosthesis reliable? Acta Orthop Belg. 1985;51(4):563-571. 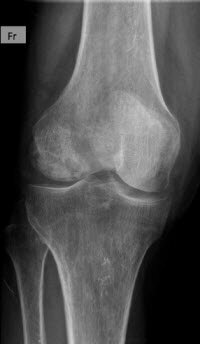 The Knee: Reconstruction, Replacement, and Revision 44-12. Cartier P, Cheaib S. Unicondylar knee arthroplasty: 2-10 years of follow-up evaluation. J Arthroplasty. 1987;2(2):157-162.